As you can see by the before picture, I was fat. I was pretty much fat from my teenage years on, and after six kids I just kept getting fatter. I would lose 20 lbs but never any more, and eventually I would gain it all back. At my heaviest I was 206 lbs. I bought the 4 Hour Body a couple years ago, but did not get on pAGG until about 4 months ago. I have really enjoyed it, and it has helped me break through several weight loss stalls. In the last month alone (on pAGG), I have lost 10lbs, and I should be at my goal weight by my birthday on Nov. 27th. I loved the 4 Hour Body because I LOVE the cheat day, and PAGG is my go-to supplement especially for cheat days. I do cheat at least once a month, sometimes two. That keeps me sane. Thank you Teresa for letting us use your testimonial to inspire others to achieve their goals. Teresa’s story is one we’ve heard from many of our happy customers. She has lost weight in the past, then put it back on. She has lost weight to a point and stalled. 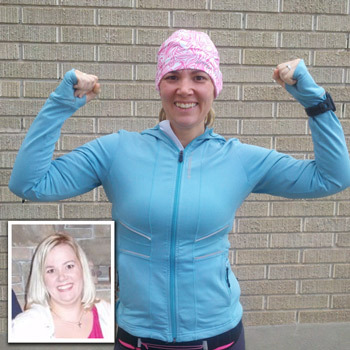 With pAGG and the lifestyle changes from the 4 Hour Body, she has made the transformation stick and now she has found a passion in marathons to further cement her fitness success. If you’re like Teresa and have plateaued or yo-yo’ed, try what worked for her. See what pAGG can do for you. If you have a comment or question for Teresa, submit it to us and we will forward it to her on your behalf.